I'm just going to copy their bio from their now defunct website. They are from Michigan I think? If you want to see their website check here. with arms still empty started around november of 98. 3 of us had previously played in another band called the bounty hunters. Originally there were five of us; jeff, greg, yann, jeremy, and aric. We recorded two songs in december of 98 for a comp and a 7'. Later in may of 99' we recorded 6 songs for a CD ep. Around november of 99' we kicked aric, our singer out. Many reasons led up to this desicion, blah blah blah. We went on as a four piece with yann picking up most of aric's vocals, and greg & jeremy filled in the gaps. 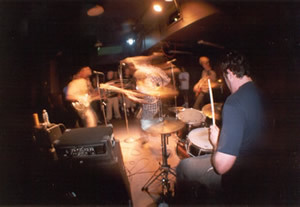 In Jan of 2000 we recorded 3 songs as a four piece, and 3 more in april, 5 of which ended up on a split cd with milwaukee's Since By Man which was released in june 2000. In August we played a couple shows out east with Blue skies burning, and then headed west for a 10 day tour with John Brown Battery. In January of 2001 greg left with arms, it was on good terms so there's no hard feelings. Kevin Spoelma now plays guitar in with arms. Some local grand rapids kids might recognize him from yesterday's gone and the bounty hunters. They seem to have a lot of random songs out there on comps and other things. Here's all I've compiled at least. As for what they sound like, it's a pretty typical sound of the era, pretty decent though. They broke up in 2002. Check it out.